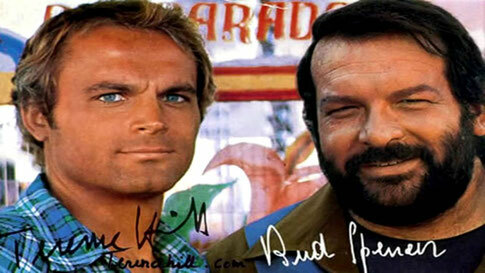 Bud Spencer & Terence Hill - Website of reckersworld! 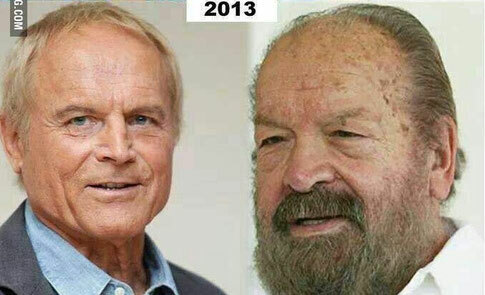 Bud Spencer (Carlo Pedersoli) and Terence Hill (Mario Girotti) are an Italian duo who did action/comedy movies, starting out doing Spaghetti Westerns in the late 60s. They were at their most popular in the late 70s and early 80s up until around 1985 when they stopped making movies together (apart from one 25th anniversary movie in 1994 – Troublemakers). Bud usually played the cantankerous big guy who despite his gruff and intimidating exterior had a heart of gold. Terence usually played the witty charmer who Bud usually found irritating. Together they were a formidable duo who could take on and kick the butts of multiple baddies at one time in the most comical fashion. They were popular around the world, especially in Europe and of course Italy where you will still find T Shirts for them in the shops! Sadly, they never made it in the USA, even though many of their movies were set there and they played American characters. Bud Spencer took his name from Budweiser Beer and the actor Spencer Tracey. Sadly, he passed away on 27 June 2016, peacefully at the ripe old age of 86. He was 6 foot 4 and a former professional swimmer. Bud Spencer didn’t do a lot noteworthy after he and Terence stopped working together (Except for maybe Detective Extralarge where apparently he gets to use his real voice! 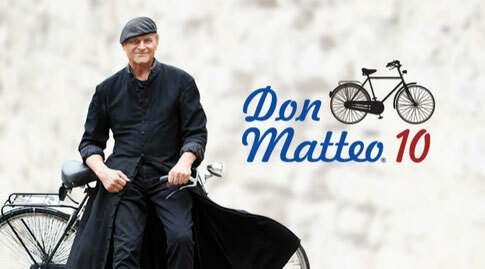 ), but Terence Hill went on to star in a long running Italian TV series Don Matteo, which has now been going for 17 years. Bud and Terence acted in 17 movies together (not including Hannibal) as well as doing similar types of movies on their own, but they were never as popular as they were when they teamed up together. They both can speak English, but Bud Spencer usually had his voice dubbed over by another actor Glauco Onorato, because his accent just wasn’t right for the American characters he played. I believe it was in 1981, at the age of 13, that I watched my first ever Bud Spencer & Terence Hill movie - "Who finds a friend finds a treasure". Although I may have seen "Two Missionaries" before that. Since then, I have had the joy of watching all 17 of their movies (some of them multiple times) and most of their solo ones too. I have even had the pleasure of introducing my own children to these movies and they love them too. This page is my tribute to these two legends of comedy and a look at each of the movies they did together. Some, I hadn’t watched in many years, but not long after Spencer's death I had a longing to see them both in action again, so in 2017 I gave them all an additional viewing and have rated them accordingly. See the list here.